The contrast between the Cherry Tree Range and Coonooer Bridge wind farms detailed in The Age’s ‘Against the Wind’ feature article is telling. It shows us that when the anti-wind campaign comes to town, there’s fear and division. And when they don’t, there’s civil deliberation of wind farm proposals and acceptance of planning decisions. Anti-wind farm groups aren’t just dividing communities, they’re costing them money. The Waubra Foundation and Landscape Guardians dominated the VCAT hearings on the Cherry Tree Range wind farm. While Mitchell Shire representatives stated at the outset that they did not reject the wind farm on health grounds, it was health arguments that dragged out the proceedings. A Freedom of Information request made by Friends of the Earth discovered the VCAT hearing cost the Mitchell Shire at least $165,000. Ratepayers are the collateral damage in an ideological fight against clean and safe wind energy. The Coalition government said their wind farm planning laws would empower local communities. All they’ve done is empower anti-wind farm campaigners. 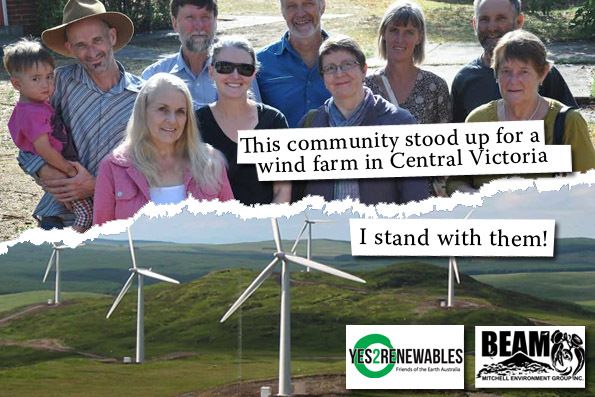 All available public polling shows Victorians support more wind farms. The Labor opposition has vowed to “rip up” Ted Baillieu’s flawed wind farm planning laws. Will Premier Napthine commit to restore fairness to the planning scheme? 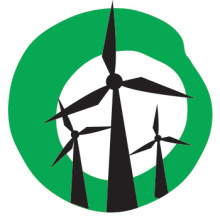 BEAM stood up for a wind farm in their region. Sign the petition to stand with them! Click here to stand with BEAM and support wind energy! From what I understand the Cherry Tree wind farm met all the current planning criteria for turbine placement (2kms from the nearest home) and on that basis it should of been a rubber stamp approval. I also believe that some people may be impacted health wise with turbines, but 2kms should be sufficient to reduce any impact. The Retexxo Grupp in Germany recommend a 2km buffer. Gerard, do you have a reference for the Retexxo Grupp 2km buffer? The only place Google knows about it appears to be in comments on Y2R, not elsewhere. Hi Mike, did you think I made it up? Hi Gerard . . .
No, but I thought it possible you were repeating something you’d read, not something you’d seen yourself. And I thought it possible if it existed it wouldn’t say what you suggested. 1. The only references they have are for fly ash plants, not wind farms. 2. They refer to small wind turbines, <1 MW capacity, not the much more commonly used 1.5+ MW wind turbines available from every utility-scale vendor. They might be marketing their services to people interested in putting up wind turbines, but there isn't any evidence that they've actually put up any wind farms. They are likely fly ash experts trying to create a new revenue stream. What they aren't are experts or representative of the wind industry or informed judgement in any way. So you'll forgive me if I consider spreading their 2 km guidance as little more than grasping at straws. If they are only talking about 1Mw turbines and they are recommending 2km then for larger turbines perhaps we need a greater buffer. No, we need to ignore irrelevant and non-expert sources that happen to agree with our biases. The evidence is that 350-400 meters is completely safe 99% of the time, and most jurisdictions exceed that to be on the safe side. The planning amendments also made local councils the responsible authority (decision maker) for wind farms. As the Cherry Tree Range case illustrates perfectly, local politicians are susceptible to fear campaigning. Local politicians are exactly that – LOCAL, perhaps it is not so much fear as misgivings about what is happening in their community. Are you saying that locals should have no say or that all decisions should be made by outsiders or higher authorities or people like FOE – god help us.